This is very simple example for creating check box in android application. Here I have created the new android project and I have modified the main.xml file with following code. 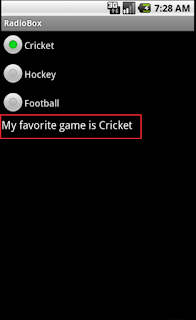 Here I have created the one radio grop and I have added some games names as option. 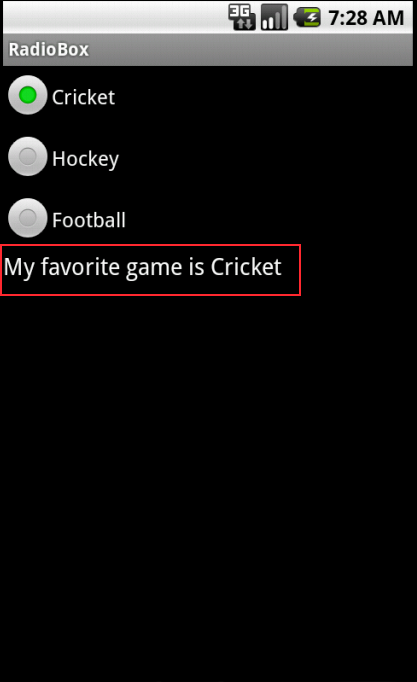 Now I am going to display the selected game with using TextView. For getting this effect I have modified the main activity java file with following code. Here I have taken the radio group handle and text view handle through using findViewById method. For adding action listener to radio group, I have implemented the OnCheckedChangeListener interface and I have override the onCheckedChanged() method. In this method I have get the selected radio id using getCheckedRadioButtonId() method. After that I have used this selected id value for finding selected game through comparing this selected id value with all the radio id value. At last I have changed the text view value with computed string. The filnal result should be like this only.